Would you like to join me in a new stitch-along? This is the project I have in mind, a vase full of flowers to cheer up a gloomy winter’s day. I’ll give you step-by-step directions beginning today. 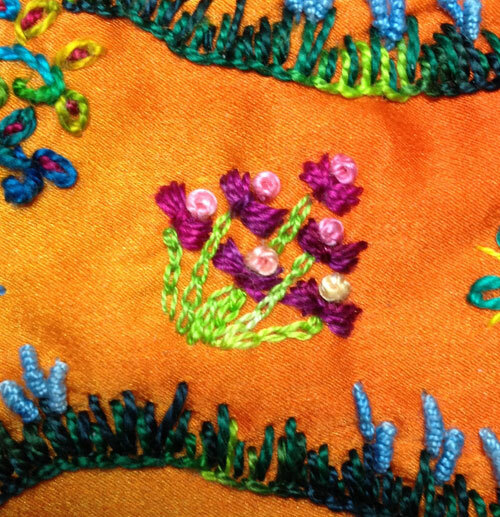 Soon you’ll be relaxing with fabric and thread and creating a colorful vase with most unusual flowers. 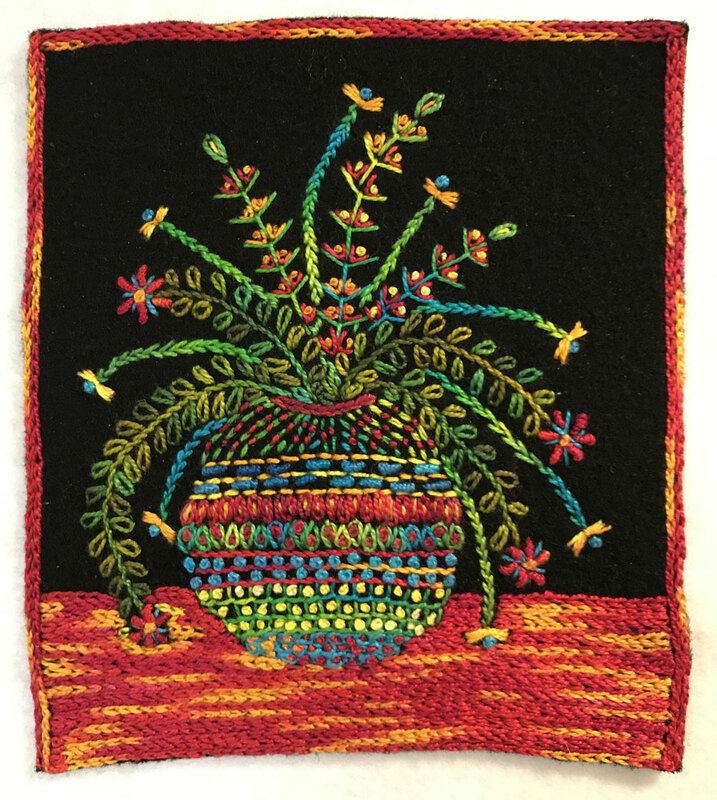 This version of Flower Vase is embroidered on wool but you can use any fabric you like as a canvas. 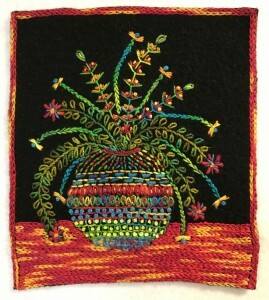 Directions will be added to the Flower Vase Stitch Along page as we go. For those of you touring Germany this Fall, please stop in to your local quilt store for a copy of Quilt & Textilkunst Patchwork Professional. You’ll know which magazine to pick up by the sight of my blue chair, Arm Chair Gardener, featured on the cover. There is also a gift inside for you. 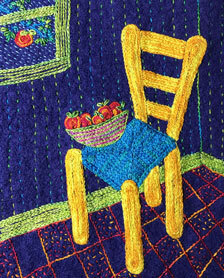 A free tutorial shows you how to make this free-form Yellow Chair embroidery on wool. Step-by-step directions and images lead you through the process. Not in Germany? Unable to read the German directions? Ah, then I have a solution for you. Check out the Yellow Chair Tutorial on my website. 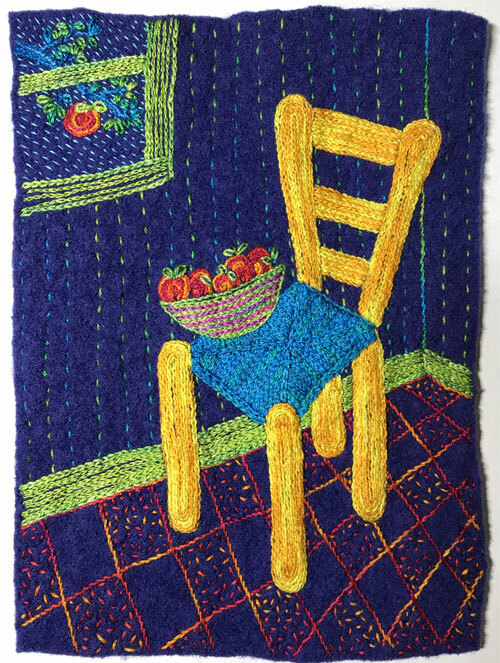 And here is a Yellow Chair Stitch Kit to get you started. 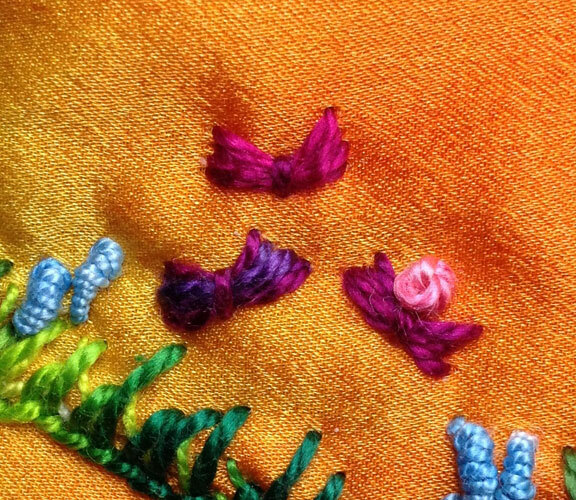 The Sheaf Stitch is another embroidery stitch that heaps thread on the surface of fabric. 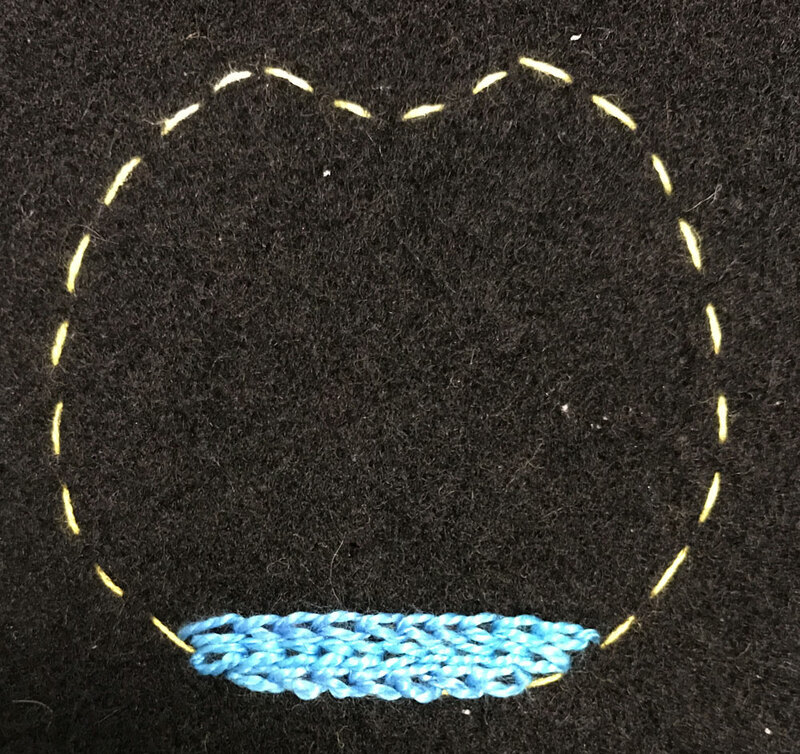 (Here you see it being used in the Silk Stitch Along Tutorial .) 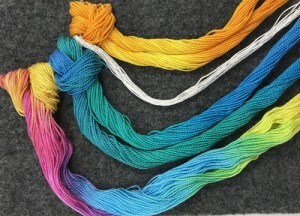 A tidy bundle, long stitches of thread are cinched together and look like sheaves of wheat. 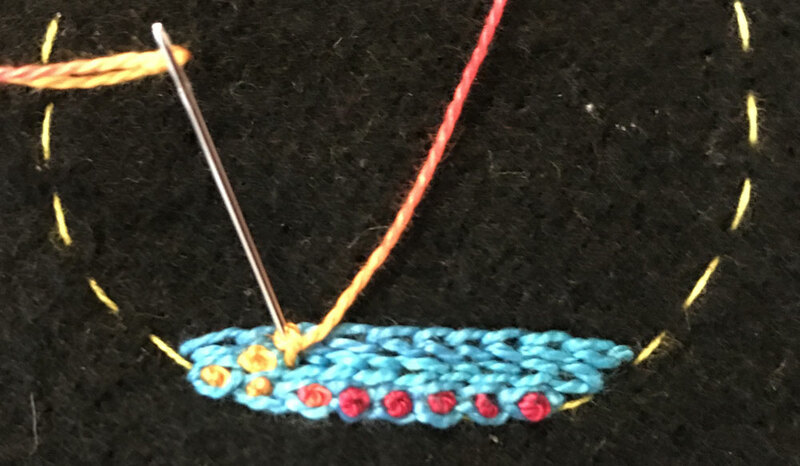 But my wheat sheaving days are over so I like to top the Sheaf Stitch with a French Knot or a Bullion Knot to make a flower. 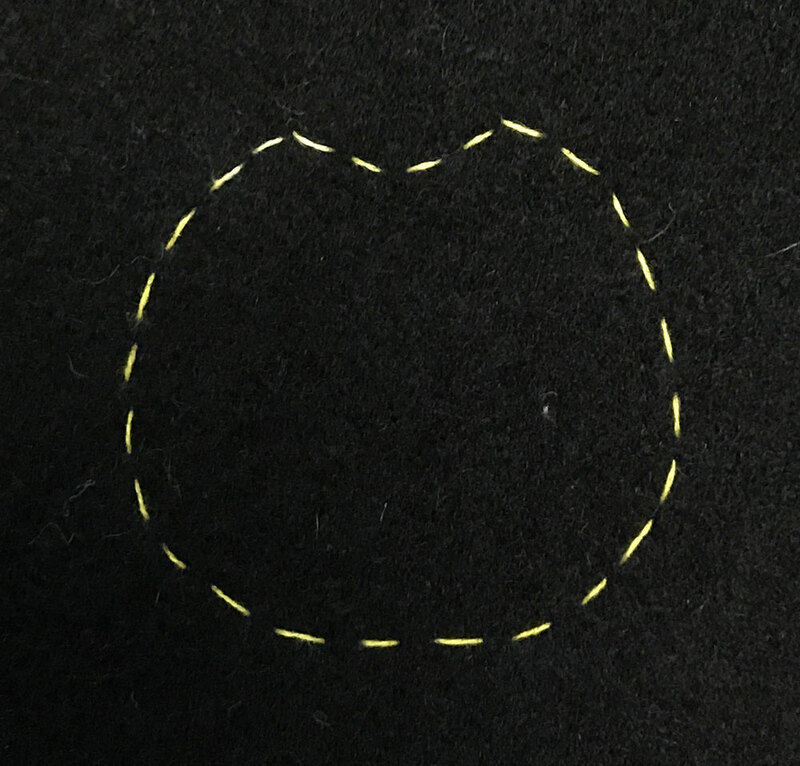 Here are directions for making the Sheaf Stitch. Have fun! 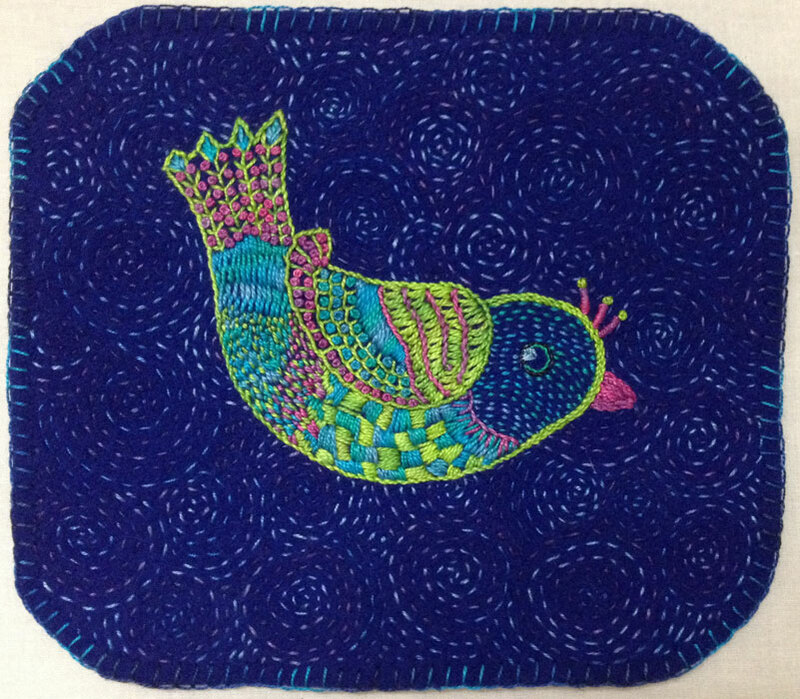 In celebration of having a new book almost published (Joyful Stitching comes out in February), I’d like to get you warmed up for embroidery with a free tutorial on making this Wooly Bird. 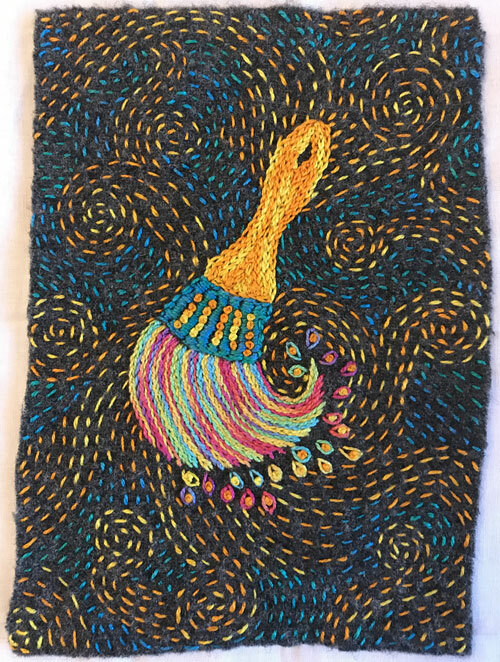 Sadly, he didn’t make the cut for the book but you’ll find his free pattern and stitch directions on the Wooly Bird Stitch Along. And in further celebration! (Cause I’m such a party gal.) I’ll be giving away a free swatch of wool along with a free pattern for the bird with every order placed on the Artfabrik Store. This offer is good now through the end of the year. 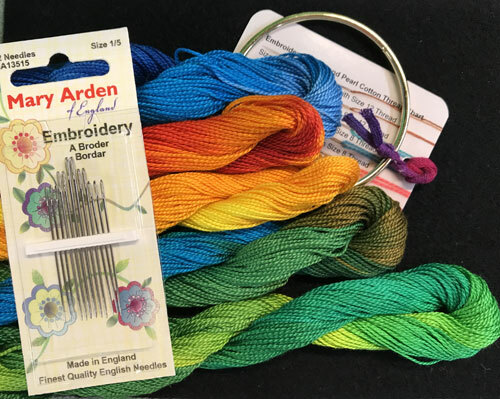 It’s our choice of color but the wool is just the right size and weight for your Wooly Bird project.